Join this call for the latest RAAIX portfolio update and outlook, portfolio company examples and Q&A session. Artivest is pleased to announce the addition of Owl Rock Capital Corporation II (“ORCC II”), a new strategy focused on generating current income, by making senior secured loans to profitable, US sponsor-backed, middle-market companies. Join this interactive webcast to discover why now is the opportune time to invest in the Altegris Millennium Fund. 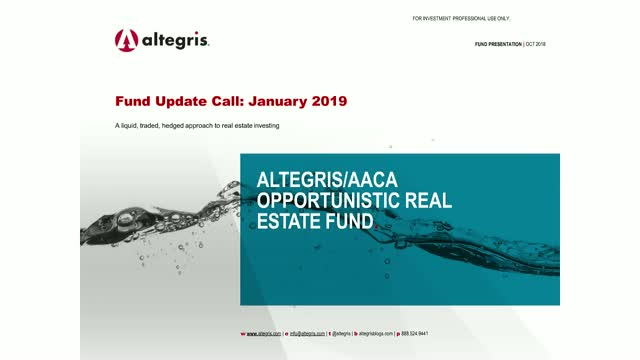 Join Burl East, CEO and Portfolio Manager of American Assets Capital Advisers, for this Altegris/AACA Opportunistic Real Estate Fund (RAAIX) Q3 2018 portfolio update call. In this video Miguel Sosa, Portfolio Strategist, Artivest discusses why now is the opportune time to invest in Private Equity and the Altegris KKR Commitments Fund. Join us for the latest KKR Commitments fund quarterly private equity update. • The decision to remain equal-weight Public Equities by underweighting Turkey and adding to the U.S. Managed Futures is an investment strategy that has historically performed well during periods of economic crisis, falling interest rates, and recessions. But how does Managed Futures perform when interest rates are rising? Altegris’ research team performed a historical analysis, which examined how managed futures has performed against equities and fixed income in various market environments over the last 30 years. • How managed futures can potentially diversify and mitigate portfolio risk. • Why we believe managed futures are poised to perform positively moving forward. • An outlook for managed futures and how to appropriately allocate to this non-traditional asset class. Note: The information contained herein is the personal opinion of Henry McVey and not of KKR or its affiliates and is presented solely for informational purposes. Please see Important Information for additional information regarding the limitations of such information, and how views and discussions of any target allocations presented herein may not be reflected in any KKR funds, strategies, products or balance sheet. Altegris is an investment research firm, with deep expertise in alternative manager selection, structuring unique solutions, and providing portfolio management and oversight. Beginning with an analysis of the current and anticipated investment environment our solutions are based on themes that we believe solve the most important client needs.